I recently acquired a McIntosh EF-1080I car amplifier that was almost completely dead. There was a small amount of sound coming from the speakers but it was quite distorted. With the amp opened up I measured the +/- 26V and +/-15V rails and all were fine. I then concentrated on the muting circuit seeing the problem affected all channels. If you need to open one of these amps, take a note of where each screw goes as replacing them incorrectly can permanently damage the amplifier. All of the channels in this amplifier model are based around the TDA7295 by ST Microelectronics. This chip features standby mode and muting on pins 9 and 10 respectively. Both must be held high (5v) for the chip to operate. The power supply section of the amp has a de-thump circuit that pulls these pins low for a small delay at power on and immediately after power off to prevent noises in the speakers. Unfortunately the mute pin was staying tied to ground. 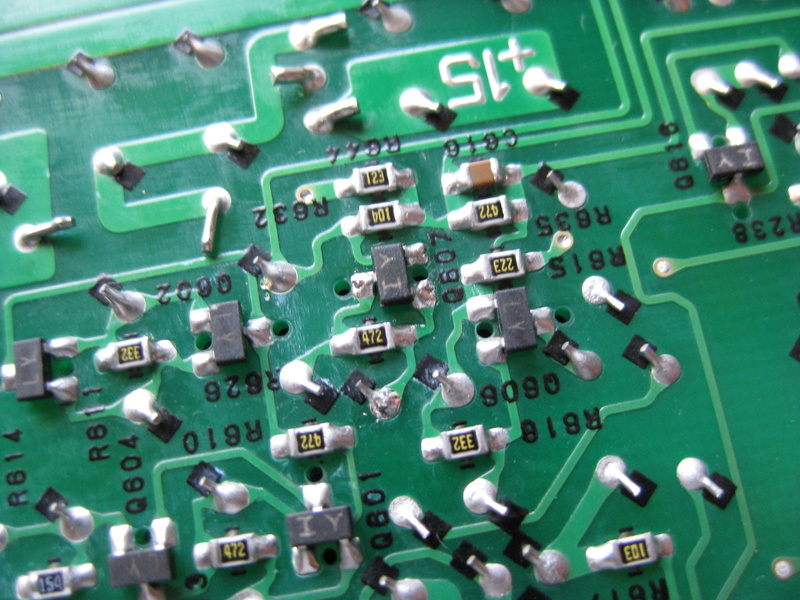 I traced the problem to SMD transistor Q607 that normally switches all of the mute pins. It actually disintegrated while I desoldered it, and replacing it restored the amp to life. The transistor bears the marking IY and is in fact a 2SA1162 general purpose PNP transistor. I replaced it with an identical part, however a friend suggested replacing it with one of a higher current rating such as a FMMT591. The FMMT591 works fine as a direct substitute and has a maximum rating of 500mA so should be a lot more reliable.